Our Miami team has been busy these past few months providing excellent thought leadership at local events across South Florida. These events spanned across the healthcare space to women in technology. Centric Miami’s Kim Caruthers joined forces with the South Florida Hospital and Healthcare Association’s (SFHHA) past-president Linda Quick on February 28 for another discussion in their series of Women Leaders in Healthcare networking events. 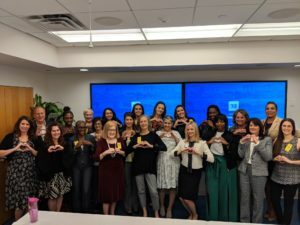 Hosted at Hollywood’s Joe DiMaggio Children’s Hospital and attended by more than 25 local female executives, the event featured an address by Joe DiMaggio’s CEO Caitlin Stella on the priorities for the health system through 2020. This event was very well-received and set the stage for the next event in the third quarter. Joe DiMaggio Children’s Hospital is one of the region’s leading pediatric hospitals, offering a comprehensive scope of healthcare services and programs in a child-friendly atmosphere. A full-service hospital, it treats minor illnesses, trauma-related accidents and some of the most complex known medical conditions. On March 7, Centric Miami collaborated with the Association of Change Management Professionals’ (ACMP) South Florida chapter and JM Family on a change management executive panel. Hosted in the JM Family auditorium, the event brought together leaders from around South Florida to lead the expert panelists’ discussion on the importance of using a change mindset to offset quickly changing technology and patient experiences. 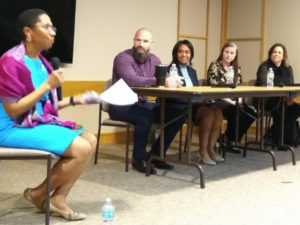 Panelists included JM Family’s Portfolio Director Jamie Wyant, Envision Healthcare’s Director of Patient Experience Shani Lenard, Citrix’s director of Strategic Programs, and Jackson Health System’s Chief Experience Officer Michelle Kingman. The Association of Change Management Professionals Florida launched in 2016. There are over 3000 Change Management related professionals in the state, and that continues to grow. 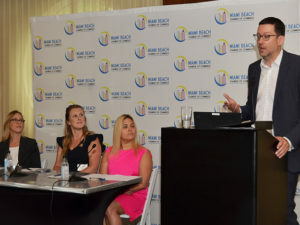 In honor of Women’s History Month, Centric Miami’s Jansen Pennock moderated a panel of female technology executives on March 28 at the Royal Palm hotel in South Beach. Sponsored by AT&T and hosted by the Pillar Board of the Miami Beach Chamber of Commerce, guests enjoyed a lively discussion of technology trends and local impacts. Panelists included: WeWork’s Community Director Anna Prisse, Emerge Americas’ Director of Partnerships Sylvia Clarke, and AT&T’s Regional Director of External & Legislative Affairs Thais Asper Keane. 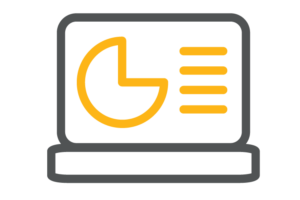 The Miami Beach Chamber of Commerce is a private, not-for-profit corporation with a membership base of more than 1,500 business and professional firms. The chamber serves as a clearinghouse for Miami Beach plans, proposals, and special events. It voices business and community concerns on critical issues and is dedicated to enhancing the business climate and quality of life in the community. The chamber also serves as a full-service visitor information center.